A person/entity wishing to participate in any form of media at Deer Creek Speedway must fill out the application. Application must be subitted and approved by Deer Creek Speedway before access will be granted. 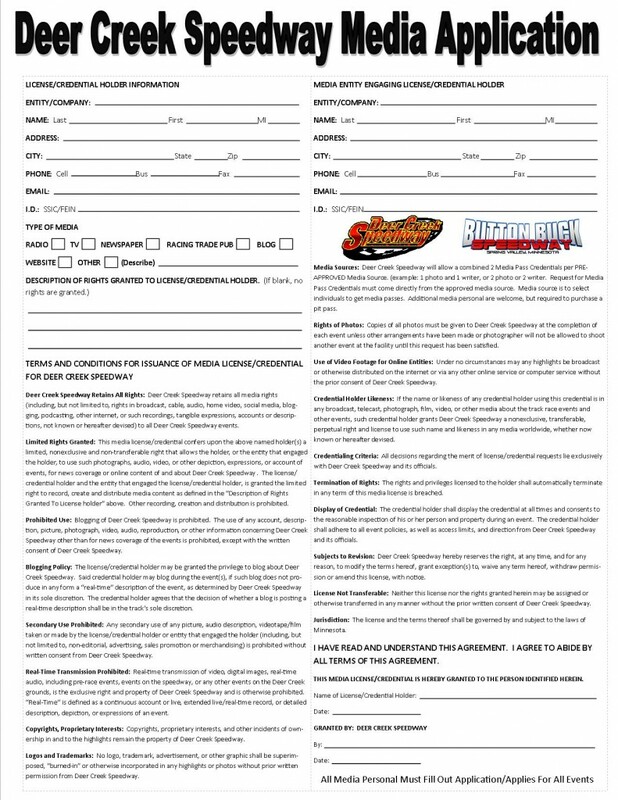 All media personal must fill out Deer Creek Speedway Media Application. This will apply for all events. Deer Creek Speedway will allow a combined 2 Media Pass Credentials per PRE-APPROVED Media Source. (example: 1 photo 1 writer or 2 photo, or 2 writer) Request for Media Pass Credentials must come directly from the approved media source. Media source to select individuals to get media pass. Additional media personal are welcome but will be required to purchase a pit pass or grandstand ticket for the event. All photographers will be required to wear a Deer Creek Speedway Media Vest when in the pit area and inside the track. Photographers will be allowed to check out the vest at the Pit Gate prior to the event and returned to the Pit Gate after the event or if the pit gate is closed, vest will need to be returned to the Beer Garden, by the driver payout. Photographers will be required to leave a driver’s license or item of value which will be returned when the vest is returned. Photographers will not be allowed to walk or take photos from the green space (grass area) between the front stretches of Deer Creek Speedway and Button Buck Speedway until the checkered flag is out on the competing race event. Click here for a printable version of the Media License. 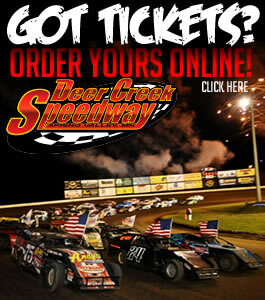 Send the completed form to the following for approval: Email to ryan@deercreekspeedway.com, fax to 1-507-754-5814 or mail to: Deer Creek Speedway – P.O. Box 591 – Grand Meadow, MN 55936.